A celebrity in her day, Émilie Ambre (1854-1898) came from a wealthy North African family and was the mistress of King William III of the Netherlands prior to pursuing a career as an opera singer. Manet met Ambre in the summer of 1879 at a spa outside Paris where he was seeking treatment for a reoccurring leg ailment. 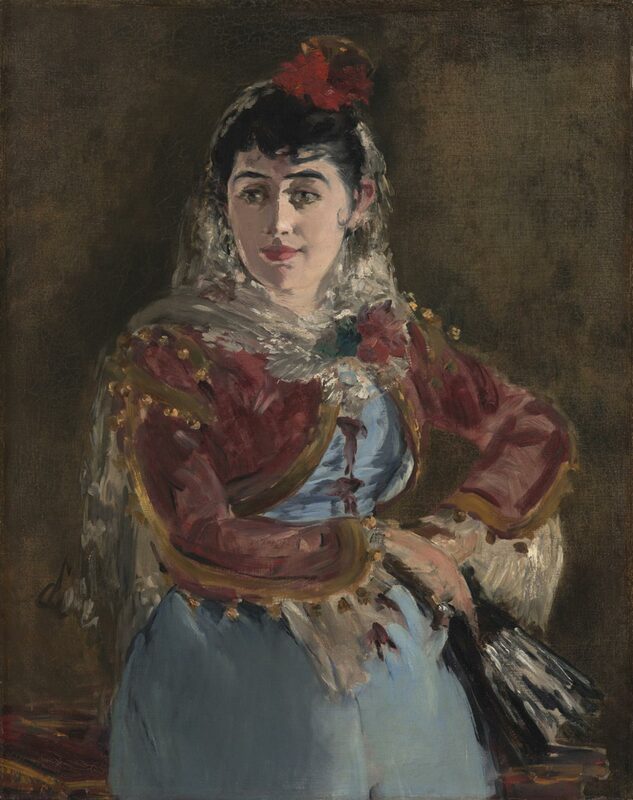 In Manet's portrait, the singer appears in Spanish costume as Carmen, the tragic gypsy heroine of Georges Bizet's opera. A popular story set in Seville, and filled with bullfighters, smugglers, and dancers, Carmen was nevertheless controversial because its heroine was not a pure or chaste woman but one who led her unsuspecting lover into a life of crime and was murdered by him. With her dark features and celebrated past, Ambre was well suited for the part of Carmen, a role she played on tours in the United States in 1879 and 1880. The harsh side lighting in the portrait suggests the stage, although the painting, with its plain background, does not illustrate an identifiable moment in the opera. Ambre's clothing and the fan in her left hand are rapidly sketched in broad, assured brushstrokes that signal Manet's own bravura performance. Jennifer A. Thompson, from Masterpieces from the Philadelphia Museum of Art: Impressionism and Modern Art (2007), p. 52.